Here's an SD vs HD comparison of the upcoming Final Fantasy X and X-2 HD remasters for the PlayStation 3. Check out how much the graphics have been improved in the HD versions of the games in an official video from Sony. The two HD remastered games for the PS3 will be released under the title Final Fantasy X | X-2 HD Remaster, however both games will be sold separately on the PS Vita. Check out the limited edition version which was revealed through a GameStop ad. 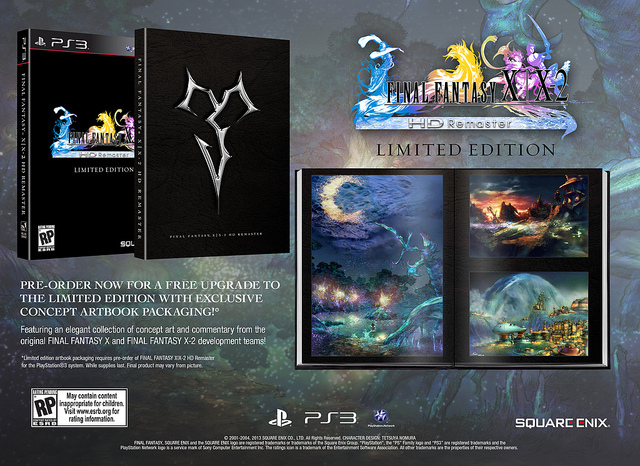 For those who pre-order the game on PlayStation 3, will receive a 24-page art book from the image above.